This article is by Gennadi Kazakevitch, Deputy Head, Department of Economics at Monash University. It first appeared on The Conversation and is replicated here with permission. analysis Many commentators have claimed that the Coalition has proposed a cheaper but backward fibre-to-the-node option compared to Labor’s top of the range fibre-to-the-premises network. However, this is not entirely correct. If the Coalition’s alternative is implemented, the capability of putting fibre through Telstra’s existing ducts to premises in the future will be retained. But leaving aside the obvious technological disparities between the two models, there are also differences in the amount and sources of capital investment. Who is supposed to pay for the node to the premises fibre connection, and when? Under Labor’s plan, the public pays through the bulk of NBN Co funding. But the funding of the Coalition’s model, for the most part, will come from the end users, during or after the bulk of the fibre-to-the-node project is being or has been implemented. The delayed node-to-the-premises stage of the project would be the main time-saving factor, while passing the costs of this stage onto the final consumer would be the major source of the promised $17 billion in public cost savings. 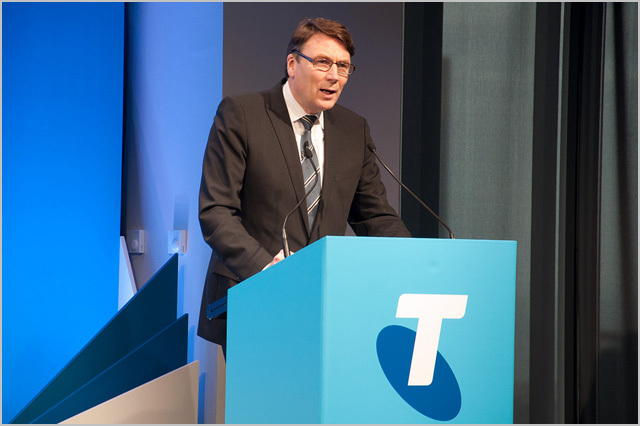 In addition to the one-off difference in the amount of fixed costs out of taxpayers’ purses, the alternative projects are different in terms of the future market structure, competitiveness, as well as in the partial modifications of Telstra’s business model and its potential financial outcomes. Under Labor’s proposal, a new fibre-optic network will be established as a natural monopoly for some time, replacing Telstra’s monopoly over copper wire. But in the long run, the NBN Co’s monopoly will be inevitably contested by rapidly progressing wireless technologies that will eventually offer comparable speeds. Furthermore, the speed of wireless competitive alternatives does not have to be at the NBN’s maximum of 100 megabits per second. The improving wireless technologies will become competitive to NBN Co if and when they are able to provide lower than 100 megabits per second speeds at competitive prices that are, nevertheless, sufficient for the majority of customers. What does Telstra get under these arrangements? The NBN Co is paying Telstra $11 billion to use Telstra’s exchanges, ducts, lead-in conduits and for migration of Telstra’s customers on its copper and cable network to the NBN. But for as long as the NBN rollout is delayed, so too will be the payment instalments to Telstra. At the same time, Telstra will continue to enjoy its landline monopoly position in areas where the NBN has yet to be rolled out yet. However, with the phasing out of the copper wire network, Telstra’s monopoly position will be usurped by NBN Co; Telstra will become one of the oligopolistic retail competitors. Needless to say, the powerful telco has and will be using its current market position to lock its current customers into NBN-based retail contracts in the future. At the same time, nothing will preclude Telstra from researching, developing and competing — from its current powerful position — in the wireless platform, and challenging the NBN Co infrastructure monopoly in the future. Alternatively, under the Coalition’s model, the NBN Co will not be a natural monopoly. A considerable proportion of Australia’s metropolitan population has long had access to the Telstra and Optus cable networks. On several occasions, Mr Turnbull indicated that those networks could become an integral part of the national broadband infrastructure. The cable networks are already providing 100 megabits per second capability, and are potentially upgradable (without replacing the actual cables) to 300 megabits per second. The technological disadvantage of those networks is, of course, in that they tend to slow down when the traffic increases. However, the peak-hour speed is sufficient for the majority of users and applications. If the Coalition does not require those cable networks to be decommissioned, Telstra will be competing in the future oligopolistic market of broadband network infrastructure in addition to participating in its NBN segment as a retailer, as well as playing a role in upgrading the wireless technologies and thus competing with NBN through the wireless segment of the market. Therefore, the Coalition’s option might lead to a potentially more competitive (and therefore more efficient) market, where participants have more incentives to innovate, and where prices should be under competitive pressure. From Telstra’s perspective, this might mean relatively lower profit margins. However, considering its role in both infrastructure and retail sectors, as well due to its favourable starting position, one would expect that Telstra might retain or increase its market share. It is difficult to predict if a potential financial outcome for Telstra should be better or worse under the Coalition. Mr Turnbull has promised that a faster rollout under of the Coalition’s network would mean a quicker payout to Telstra of the NBN Co’s contractual obligations. Perhaps this uncertainthy is best reflected by the reaction from markets: since the Coalition’s announcement of its broadband policy, Telstra’s share price has fluctuated within the trend of the past three months. How can the Fraudband recover its costs in a competitive market? Fixed line competition will Increase prices on average across the country with regional users paying much more! Presumably the Earl of Fraudband will intend to recover the costs by selling the whole system. I wonder who might be interested in acquiring a nice new near-monopoly fixed network? Of course those not in the favoured areas will pay a lot more, if they get anything at all. It seems the Nats haven’t worked out yet that it will be their people who mostly cop it. And if the Nats don’t wake up in time, there are going to be some very angry voters when they find out what has been done to them. But in the long run, the NBN Co’s monopoly will be inevitably contested by rapidly progressing wireless technologies that will eventually offer comparable speeds. Meanwhile the underlying technology NBNCo’s offers will remain stagnant at a maximum of 1Gbps? The increased reliability and quota won’t play a significant roll? I broadly agree with the article that Telstra can and will leverage their position in either case and remain a major provider, but minor errors like the one propagate widely debunked myths that are used to undermine intelligent debate on the subject. I understand what the authour was trying to say, that wireless will be an increasing viable alternative for a small sector of the market, but the way it is written implies the entire market will come under threat. When this point was brought up in the comments on the original article, the response was to refer to a previous response where the author stated it is not a comparison of technological platforms (among other things). I suspect the economist who wrote the analysis was only allowed to comment based on certain “facts” he was supplied. His job was not to question them. Agreed NK, some of the fundamental assumptions made in the article are simply incorrect. Sure, over time mobile broadband will improve in performance, but unless mobile providers start increasing tower density dramatically it will remain unreliable. Which reminds me of a huge problem with the LNP NBN cost assumptions – they believe competition from wireless only consumers will dramatically increase, reducing NBN profitability, and base this on current uptake rates. But what they fall to account for is the number of people on wireless broadband without a fixed line service because they can’t get a decent fixed line broadband service today. This includes people on RIMs, people who live in areas with no port availability, people who live too far from the exchange, people who’s copper line is too degraded… What will all these people who have struggled on mobile broadband for years do once fibre is rolled up their street? Sign up immediately and only use their mobile broadband wen they’re away from home. Far from an exponential increase in mobile broadband only consumers, I predict that the availability of cheap, high speed reliable fibre will actually result in a substantial retraction of mobile only consumer numbers. It won’t substantially reduce the number of consumers with mobile broadband capability – that’s just part of phone plans these days and everyone likes to stay connected. But large numbers of people will be jumping on the fibre bandwagon even if they haven’t had fixed line connections for years. First is the most obvious one is the speeds their saying wireless “may” be able of doing. Fiber is more than capable to doing these “theoretical” speeds and much much more. It’s all good and well to say its may improve but why work w/ a “maybe” when you have an existing medium that already *can*. Second is the other side of the coin that the wireless camp are keen to ignore. Advances in wireless technology is not mutually exclusive to advances in fiber. Just because wireless *can* get better does not rule out that fiber can *also* get better. They are not mutually exclusive technologies. One technology does not stagnate just because the other is improved. Even more so w/ fiber because their capacity at this point is just the tip of the iceberg so to speak. Just as there will be improvements for wireless to “catch up” to fiber like speeds there will also always be improvements to fiber to increase its capacity/speed to higher levels than one available. Credibility instantly and irrevocably gone. “Furthermore, the speed of wireless competitive alternatives does not have to be at the NBN’s maximum of 100 megabits per second. The improving wireless technologies will become competitive to NBN Co if and when they are able to provide lower than 100 megabits per second speeds at competitive prices that are, nevertheless, sufficient for the majority of customers. Clueless and more clueless. People with a clue already know that wireless is a complementary technology. It isn’t hard at all. Telstra will be much, much better off with the Coalition’s version. Seriously, there needs to be some basic level of competence with the articles that are republished here. This article is just drivel. If as Turnbull has proposed, NBN fibre is not going to be laid in areas where the cable networks currently are, how can the Telstra & Optus cable be said to be providing competition? Surely competition can only exist where an end user had the ability to choose one over the other. Not quite correct – FTTN will be rolled out to those areas with existing HFC cable in their second stage from 2016 to 2019. Everyone seems to ackowledge that Labor’s NBN is technically superior, but has a high cost in dollars and time taken to rollout.. The obvious answer is for Turnbull to complete Labor’s original plan using an army of foreign labour being payed at minimum wage or less. Otherwise like the union controlled desalination plant in Victoria, the workers will be payed huge salaries and deliberately delay the project for as long as possible in order to maintain their lucrative contracts. What I got from that is that Wireless is the be all and end all…and Telstra is set for the future by ripping everyone off even more money. I cannot believe that people can think that wireless is the future, look at the current price per GB comparing wireless to any fixed line. The very nature that Wireless is a shared medium will mean that it will continue to more expensive than fixed line. I, living out in the country, will be getting NBN fixed wireless no matter what, from the plans that I have seen so far, the cost is a lot lower, and actually has decent download caps. But I would much rather have Fibre for the 4x faster speeds, and lower latency, and probably higher reliability. Most of this wireless talk seems to be about, basically, mobile devices. This is not what will happen, it will be fixed location wireless, I do not think it would be possible to get comparable plans from a mobile connection. This is misleading in that it’s not the public per se; until such a time as the current NBN fails to achieve sufficient revenue to pay back its funding, it’s the users who pay for the fibre connection. Whilst acknowledging that the required rollout rate has not yet reached the required levels, neither has it yet been shown to what extent it will impact revenue. As per above, the difference is not in who pays for the CAN but in when and how much. The coalition plan is to remove the efficiency of a bulk rollout and to pass the extra expense on to customers up front, but to also make it optional (at least it’s talked about up as if it were up front, but I don’t see why other arrangements couldn’t be made). This is true, but only because the coalition chooses not to recognise the costs. Up To. The speeds are very much not guaranteed, as your follow up comment recognises. Slowing down under use is a pretty major flaw. That said, supply and demand in the coalitions competitive infrastructure environment will sort out what users want and will pay for. The greater question to me is what impact such competition will have on the coalition NBNCo’s revenue models. Will the HFC always be a cheap and nasty option, or will the owners invest in its upgrade? Will it be open access? That is very presumptive about users’ future connectivity and bandwidth requirements. Have you even considered applications outside of internet? Which brings into question the extent of the structural separation, yes? No. Wrong. Specifically, greater competition does not automatically beget greater efficiency. That is part of the definition of a natural monopoly (which you recognise earlier in your piece). When it is less efficient for competitors to provide competing services because of the costs to provide them. It is very subjective as to whether more competition gives you greater efficiency. This is a huge flaw in the coalition plan. They advocate competition in a natural monopoly environment (Australia-wide communications). They then (apparently) fail to model how this affects their revenue and cost models. They want the same funding model, albeit for a lesser headline amount. They’ve commented that they expect similar revenues. They have also mandated that it will cover the same 93% of Australia. And yet they advocate infrastructure competition specifically to drive down prices where competition is possible. Then they don’t model it. They don’t give any indication that they have thought about HOW they will pay for the satellite, fixed wireless, and uncompetitive fixed line areas, whilst competition erodes their profitable customer base! Who wrote their plan? Bergholt Stuttley Johnson? Couldn’t agree more. For example if, say like HFC, two providers roll out to an area. All being equal, say they each get half the user base. They have to charge twice as much to pay back the initial investment. Now competition will make them more efficient, but that initial investment doesn’t get any smaller, and they still have to recover it, or like HFC, each run at a loss to try and put the other out of business. Will they halve the price to recover only half the investment? It is the only way to really get to the same price as if only one of them rolled out and got all the user base. A truly excellent, insightful and well considered comment. In other news, NBN co has released end of March rollout figures. These are combined February and March figures, as NBN co didn’t release end of February figues. 142,600 estimated premises started work in February and March. 873,700 estimated premises were underway at end of March. 19,000 estimated premises completed work in February and March. Shortest constuction period for completed was for 2GOS-02 which started in May 2012 and completed in March, for a period of 10 months. 90th percentile period for completion dropped to 13 months with about 40% of those lond delayed sites being in the Syntheo areas of WA, SA and NT. Assuming NBN co’s completion dates are correct and current commencement rates continue, the 30 June premisis underway will be about 1 million, with a 90th percentile time in exces of 15 months, which is consistent with the 3 month delay announced by NBN co. About 50% of the most delayed locations in this projection would be in Syntheo areas. It’s pretty academic; wireless and over-the-air comms will become a dominant method for portable devices to interact. It’s the logical option. Trends show this clearly. However, this is being miss-construed as “the end game” for connectivity by any number of “experts”. Which is a flawed argument. Spectrum, infrastructure costs, capacity and numerous other aspects mean this will never be able to compete with fixed line services as a 1:1 offering. Sorry. There’s simply more pieces to the puzzle, which means a greater input cost. But we are forever told wireless is “the answer”. It’s not. It’s an answer. This is why Telstra hasn’t simply stopped deploying Fibre into greenfield estates, any more than it has stopped providing and periodically upgrading HFC docis versions. I’d argue that it’s the only method of communication for most portable devices. But I’m being pedantic about the term wireless as including Wifi, when you seem to mean mobile broadband. While there are certainly plenty of people with mobile broadband only for mobile devices, there are more who only use it to complement fixed-line supported Wifi. As I stated earlier, a lot of the mobile broadband only consumers are only in that position due to a lack of choice in the current environment.